Harbinger Winery is a new winery, but Sara Gagnon, the winemaker, has already proven herself. 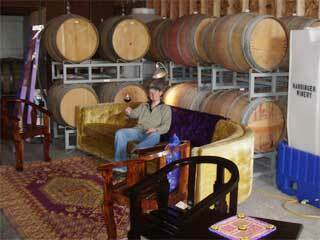 She produced the first Harbinger wines while she was still working at Olympic Cellars. Now she is out on her own, and her first wines are good drinking. 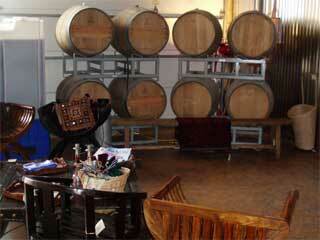 The winery is located in an industrial section of Port Angeles, west of town along route 101. We drove past the winery dozens of times on our way out to Dry Creek Farm to buy Harley's eggs or heading out to Lake Crescent Cottage. We noticed the winery was open for business, so we dropped by to see how things were going, and we were quite impressed. The building may be a big sheet metal industrial space, but the winery inside is cozy and funky, and it takes advantage of the industrial setting, the way artist's studios took advantage of their industrial spaces back in 1970s SoHo. Unlike many studios, the art at Harbinger Winery is accessible, and delicious. We settled down at the bar with the winemaker and tasted a little bit of everything. That means we drank reds, our favorite color of wine. The Dynamo Red, a non-vintage mix of merlot, cabernet sauvignon, and syrah, was delightful. There were fruits, tannins and berries, but everything was extremely well balanced, with all the notes playing together. The notes were strong, but the wine was not hot. The alcohol level was a sane 13.5%. We bought a case, then and there, and it is just as well. According to the tasting notes, only 135 cases were produced. The 2004 Syrah was richer and more tannic with a strong varietal character. We all agreed that it would benefit from some aging, and it would make a fine food wine, especially with lamb. The 2005 Cabernet Franc Rose was a perfect picnic wine, with light, fruity flavors, and a buttery, sort of popcorn, finish. This is the wine to take with you on a trip to the Hoh Rain Forest for a picnic at Five Mile Island. The 2005 Blackberry Bliss, a wine made from blackberries, was already sold out. It had been a hit at the Wine and Chocolate open house. Many Washington State wines have a strong blackberry note, but this wine, being made from blackberries, had a much fuller, essence of blackberry flavor. It is not a sweet wine, definitely not jammy, but a fully realized dry red wine. It would make good drinking on its own, or with dark chocolate or vanilla ice cream. While sold out now, there will be a 2006 vintage. 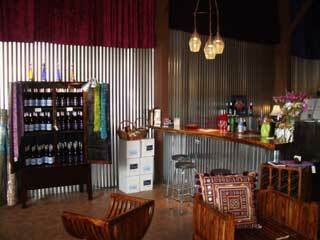 Harbinger Winery is the sort of winery that jaded oenophile dreams of visiting. It's funky. It's charming. It's undiscovered, and the wines are delicious. It's just plain fun to visit this place. Drop by 2358 Highway 101 in Port Angeles, Wednesday to Saturday, from 11AM to 5:30PM, give them a call at (360) 452 4262, or use the feedback form. There is a dramatic story behind this place. For years, Sara Gagnon, Harbinger's winemaker and her business partner Tammi Hinkle, kayaking guide extraordinaire and owner of Adventures Through Kayaking, had dreamed of working together on their own winery. 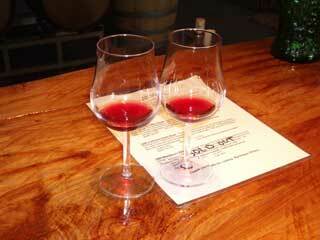 But, Tami continued in her kayaking job, and Sara continued as a winemaker at Olympic Cellars. Then, fate took a hand. Both women took a small plane flight on the Olympic Peninsula, and the worst happened. The plane crashed on a mountainside. Tragically, the pilot was killed, but Tammi and Sara, though injured, managed to hike to safety. Well, there is nothing like brush with death to convince you that you had better follow your dreams while you have the chance. They decided their terrible experience and the loss of their friend, were a harbinger. Harbinger Winery was born of this tragedy, and you had better believe that it is just as life affirming and joyful as it should be. This is an unofficial Harbinger Winery web page produced by the Kalebergs. To contact the winery, call 360 452 4262 or use the feedback form.